At this point, it feels like just about every wants in on the ultra light / sugar replacement trend right? Maybe in today's world it's just easier to jump on a bandwagon than it was in the past? My point is, have you noticed that Blue Bunny didn't jump on it? Oh wait.... they did! 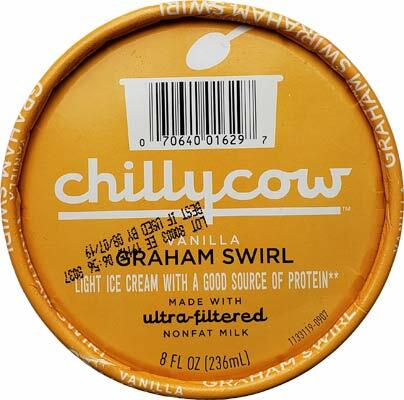 Chilly Cow is made by Wells Enterprises, the folks behind Blue Bunny Ice Cream. I first spied it way back at the beginning of March. It was $5.49 for a two pack (equivalent of a pint) at Price Chopper. Coming in 2 packs of 8 ounce containers, there are seven flavors in all: MINT dark chocolate chip, brown butter salted CARAMEL, vanilla GRAHAM SWIRL, chocolate BROWNIE BATTER, COOKIES N' CREAM, chocolate chip COOKIE DOUGH, sweet cream PEANUT BUTTER. Sorry for the caps, but that's kind of how they label the boxes. The graham, mint, brownie, and caramel flavors can also be purchased as a 5 pack of 3.5 fluid ounce bars. I eventually picked up a two pack at walmart for less (their website says $3.98). I think I was focused on the price being lower and totally spaced on the fact that these are all about sugar replacement. Ugggg. You guys know I can't handle sugar replacement. Let's open it up anyway. Wow that's horrendous looking. Granted, it's been in the freezer for awhile, but it was also sealed. To give you some perspective, a 4oz serving of this stuff is a mere 95 calories. Think about that for a minute. It doesn't break triple digits. Or in halo top math, it would be 380 calories a pint. Ok, that's better(ish), but do I dare taste it? No, I really don't want to... where'd my daughter go? I think she's hiding from it because she knows better.... You know, as an added bonus, if a little stevia and a lot of erythritol don't make this one slide right through your system, maybe the glycerine will... ok, I'm still mad that I spaced out and accidentally bought this one. It is what it is. As a consumer, I have the right to be frustrated by my purchases. Fine fine fine, I'll give it a try.... ok, the good news is that the swirl is good. It has lots of noticeable graham flavoring. No complaints there. What I will complain about is this odd, slimy nonsense going on here. Can you see it? It's kind of creepy actually. Ice cream shouldn't glisten like that. The ice cream had that weird, spongy, astronaut ice cream vibe going on, so I mixed it up and created the glistening mixture before you. The flavor isn't awful, but I am very much driven by site when I eat and I don't think I would eat this even if I could (I'm pretty sure I'll regret the half dozen small bites I did take). Oh, there's also an odd lingering aftertaste (though I guess that's not really surprising, is it). I do think they tried but I can't recommend this in any way, shape or form. You're own your own with this lineup. So, as always, the floor is now open for everyone to chime in. These have been gaining shelf space over the past four months so I can't be the only one who's tried them. Even if you saw them, picked it up, checked the ingredients, and then put it down, let the rest of us know that too. Bought sweet cream PEANUT BUTTER. 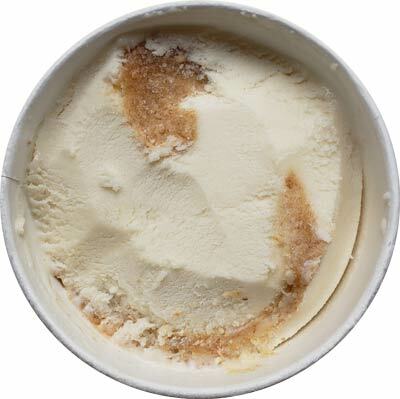 Pb swirl was good, would eat it on its own, Sweet cream was to... dry, i guess astronaut icecream. Breaks off in chunks/shards. But i expect lowsugar stuff to be hard, always have to wait for it to melt. Swirled up, easier to eat, didnt notice it being slimy. But you lose the PB so it is pointless. I saw these at my local Shoprite and was intrigued by the Brownie Batter but i didnt purchase them when i realized it wasnt ice cream. I did purchase the new TH Caramel Hot Chocolate and Caramel Brownie Overload. Paid full price I was so excited. Warning Dubba the hot chocolate has chilis...holy spice in the swirl! 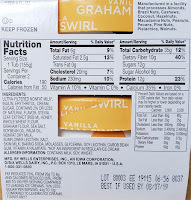 I also did not like the Vanilla Graham Swirl but was surprised that the Brownie Batter was pretty good. With Sales and Coupons I only paid about $1-. For what it is I liked it enough to buy again but only because it was inexpensive. Not worth $4-. Not gonna lie, I love these. Texture doesn't bother me at all. I liked the Brown Butter Caramel, and both Peanut Butter varieties. I also like they they are bit more portioned controlled versus Halo Top or the Breyers Delights. The Mint Chip wasn't bad, but no mint chip will ever compare to Baskin Robbins in my book! Tried the Cookie Dough on sale and thought it was OK overall, and good for a "healthy" ice cream. Cookie dough ice cream was good (not as good as the best full fat and sugar stuff but still felt like a dessert and was better than several normal cookie dough ice creams), chocolate chips were just OK. Texture didn't seem that noticeable to me, but I don't mind cheap ice cream (which sometimes has weird textures) and remember that texture is one of Dubba's bugaboos. Didn't have an aftertaste/burn that I've sometimes gotten with protein/sugar alcohol ice creams. Don't know if I'd buy it regularly/not on sale, but I like it the most of these types of ice creams that I've tried. 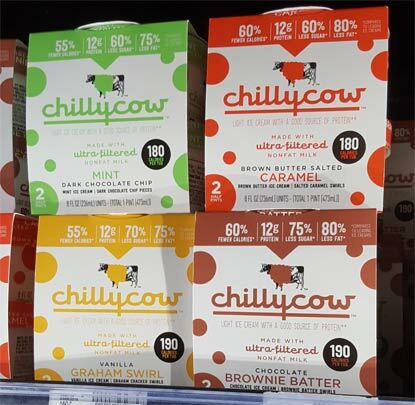 Well based on the last couple of posts here I'm totally up for trying the cookie dough and brownie batter flavors of Chilly Cow. I love Halo Top's birthday cake flavor (it's far better executed than many "normal" birtday cake flavors) and the artificial sugars don't bother me, as long as SOME actual real sugar of some type is involved too. I will say this though : sometimes these companies go too far into trying to make ice cream a full blown "health food" that it's just gross. 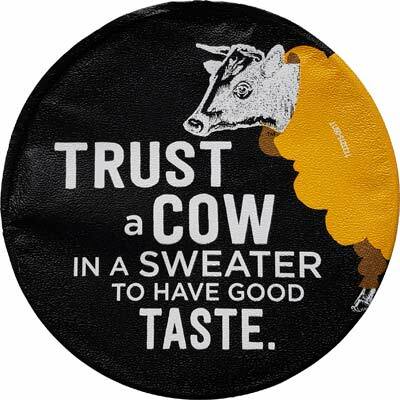 I found this out the hard way when I got my hands on some of Halo Top's dairy-free line. Now I have zero problem with coconut milk desserts. I buy "So Delicious" coconut milk cookie dough ice cream often. But for those to work, you need *adequate* sugar. 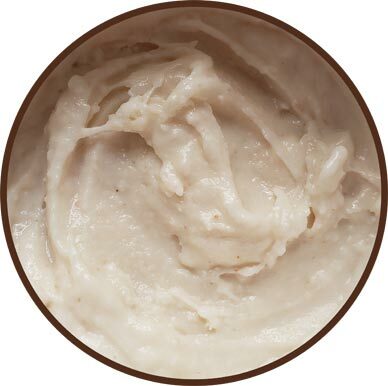 When the coconut cream mixed with Halo Top's special "reduced sugar blend" the overall flavor was akin to a coconut-scented clay. It tasted exactly how clay smells. I mean if I ever become so concerned with calories that I think "So Delicious" is too much, I'll just eat some fruit. It's sweet, it's healthy and most of all, it's edible. I tried it too (the brown butter caramel one) after hearing good things about it, and it's a huge nope from me. I don't get how people can be satisfied by this stuff. Ooops, "accidentally" deleted the opinion of someone who thinks too highly of themselves. Bugger off and start your own blog if you can't handle my __OPINIONS__. 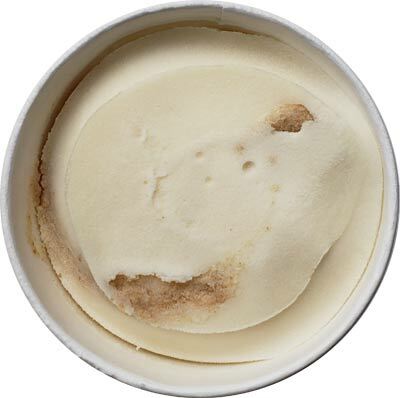 I bought three of the flavors and the consistency in texture was vastly different between flavors and even from tub to tub, within the flavor. The Caramel one was the smoothest, but the mint one was like Styrofoam, even after letting it sit out for a bit. I think I'll stick with real ice cream and just moderate portions. The bars brownie batter bars are amazing, only 110 calories and 6g protein. I have one every night. 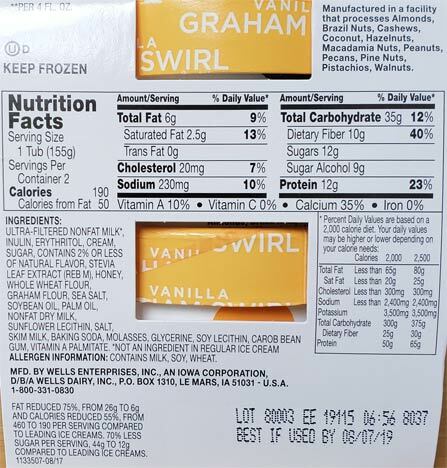 My son eats the vanilla with graham, which he loves as well. Poor representation of a great product!, I happened across the bars, caramel and chocolate at a local market. Can’t believe that these can be this good with such little sugar. Do not be dissuaded by the original post. You will be missing a delishous treat if you are. I got the PB and ate both. My only food today. My digestive tract is not happy But I thought the product was way better than Halo Top.